The impeachment was the consummation of a lengthy political battle, between the moderate Johnson and the "Radical Republican" movement that dominated Congress, for control of Reconstruction policies after the American Civil War. Johnson was impeached on February 24, 1868 in the U.S. House of Representatives on eleven articles of impeachment detailing his "high crimes and misdemeanors", in accordance with Article Two of the United States Constitution. The House's primary charge against Johnson was with violation of the Tenure of Office Act, passed by Congress the previous year. Specifically, he had removed Edwin M. Stanton, the Secretary of War (whom the Tenure of Office Act was largely designed to protect), from office and replaced him with Adjutant General Lorenzo Thomas. 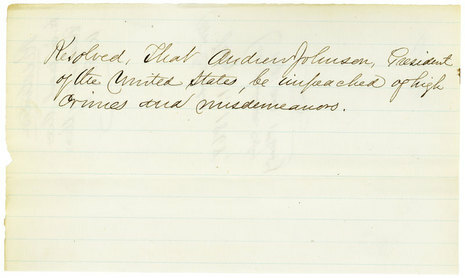 The House agreed to the articles of impeachment on March 2, 1868. 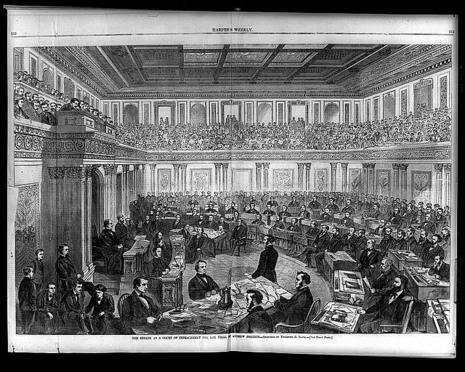 The trial began three days later in the Senate, with Supreme Court Chief Justice Salmon P. Chase presiding. Trial concluded on May 16 with Johnson's acquittal, the final count falling one vote shy of the required tally for conviction. The impeachment and subsequent trial gained a historical reputation as an act of political expedience, rather than necessity, based on Johnson's defiance of an unconstitutional piece of legislation and with little regard for the will of the public (which, despite the unpopularity of Johnson, opposed the impeachment). Until the impeachment of Bill Clinton 131 years later, it was the only presidential impeachment in the history of the United States.